The Government of Antigua & Barbuda have now added sailing & swimming to the list of National Sports. 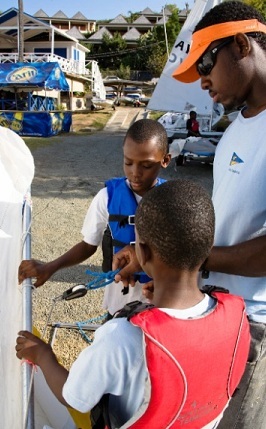 This allows these sports to be included in every school’s curriculum giving every schoolchild in Antigua, from 8 to 18 years, the opportunity to learn to sail and swim – in school hours and without charge. The potential benefits of this programme are manifold – to both the Antiguan community and the Yachting Industry, which is growing year by year. No other sport in Antigua can offer our young people the number & variety of employment opportunities – as well as becoming competitive racing sailors, they could, in time, become captains, crew, bosuns, engineers, riggers, sailmakers, sailing instructors, etc. The first step is to get them involved in the sport. The Academy will be funded by donations from yachts, individuals, groups and businesses – both in Antigua and overseas. Please check out our out all the ways you could get involved in supporting this great initiative.